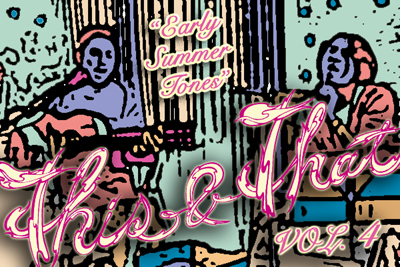 Kick off your weekend with the summery sounds of This&That. As always, the line up is hot and the drinks are cold! Sean Harada and Tama Tsuboi (from THE STONE SUN) with Naoki Kawashima playing a hot acoustic set just in time for summer. Yuyake Lamp, featuring vocalist Yunn, formed in 2006. In addition to numerous live performances, the band’s songs have been featured in major Japanese TV programs and commercial films. Their piano pop melodies are always catchy and memorable, with lyrics that are pure poetry, about everything from love and friendship to our planet’s precambrian era and the wonders of the human body. Above all, though, there’s the vocals of Yunn—with her high, almost child-like voice, she has this way of bringing to life the words she sings. Singer/songwriter from Texas, Chieko now resides in Tokyo and performs in some of its many “live house” a few times a month. For This&That Cafe, guitarist Takahiro Kaneko will join her for a special acoustic set. Funk and rare groove DJ otherwise known as Englishman Nick Coldicott. of 2010. Duality is a theme that Jay constantly explores with his art. Being a bilingual Japanese American, there is a duality in thoughts, words and translation. He also receives a lot of his artistic inspiration from the Japanese culture itself, and how that differs from his American life. His art is a mix of abstract watercolor and hyper detailed robot technology, constantly questioning the balance between man vs nature, old vs new. Born in 1978, Chimu creates artwork for apparel companies and murals for beach houses. She recently completed an 8 month adventure backpacking from Canada to Chile and now works in Tokyo. This&That Cafe is a free event open to the public in which artists from all genres and backgrounds donate their time and talents in the spirt of sharing. It is a place where music and visual arts meld in unexpected collaborations. A forum for artists from afar to meet with local luminaries amidst the dense and eclectic pool of talent in Tokyo. A venue to gather, exchange ideas, share artistic inclinations and wax poetic in a causal community of old friends and new acquaintances. Come early to get a seat and take advantage of the fetching fare on the SuperDeluxe menu, or just pop in for a drink on your way home from work. All are welcome. If you have an idea for a future This & That Cafe event, please drop a line to <yakimonos@mac.com>. We look forward to hearing from musicians, DJ, visual artists et al looking for a new and exciting venue for their expressions.